↑ Musser G, Amori G, Hutterer R, Kryštufek B, Yigit N & Mitsain G (2008). 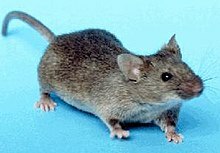 Mus musculus. In: IUCN 2008. IUCN Red List of Threatened Species. Downloaded on 10 October 2008.